YellaWood® Deck Boards are KDAT! YellaWood® KDAT Pressure Treated Deck Boards give you the luxurious appeal of a composite or Cellular PVC deck while maintaining a completely natural look at a fraction of the price! 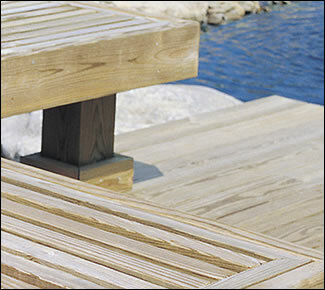 Prior to installation, keep YellaWood® Deck Boards elevated, covered and completely dry. 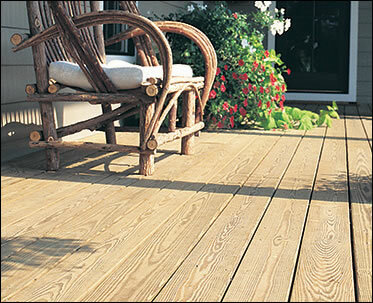 Deck Boards must be painted, stained or sealed immediately after installation. Otherwise, moisture removed during kiln drying can be reabsorbed into the wood. Sealant or stain with UV stabilizers will minimize the sun's impact. Stains should also include a water repellant in their formulation. If painting, use an oil-based primer (including on cut ends) followed with 2 coats of high quality acrylic latex. We sell YellaWood® KDAT SuperSelect Premium Grade with Lifetime Limited Warranty. If you prefer KDAT YellaWood® Balusters and Railings, we have those too! Of course, any of our other exterior Balusters and Railings can also be used. Additionally, we have 1-3/8" thick YellaWood® Plain Boards in two widths that work well as Deck Boards, and YellaWood® Tongue & Groove Porch Flooring. Purchase by the foot or as a 3" Sample. Lengths shorter than 8' are not returnable unless defective. Top edges rounded for superior appearance and almost no splintering. Bottom of 1-3/8" size has stress relief groove to help reduce natural tendency of wood to cup. Overall length may be 1/4" shorter than listed but will be consistent for each shipment. Shipping Info: Select one--------------- This item is 58’’ or longer. I read the 'Important Shipping Info' link above.- This item is less than 58’’ in length.